I am a HUGE granola fan. But never of the store bought variety. I grew up eating my Mother’s homemade granola. She made it in big batches and cooked it in the oven in the same huge aluminium pan that the 20lb turkey was roasted in at Christmas. A pan, I might add, she still has today. I used to like adding the raisins and watching them toast through the oven door. I loved when they puffed up into crispy round balls if we left it in a few minutes too long. When I first moved out on my own I would follow her recipe loosely and make my own huge batches of granola to be enjoyed with yogurt on mornings before rushing off to classes or to work. I haven’t made granola in a really long time, quite simply because I can’t be bothered to turn on my oven. It is too fuel hungry and throws too much heat and I seem to bake everything-cakes, bread, cookies- on the stove top these days. But with all my recent yogurt making I have been craving granola. I consider dusting off my old oven toasted recipe then last month I stumbled across a Stove Top Granola recipe online and almost smacked myself on the forehead. OF COURSE you can granola in a pan ON TOP of the stove! Why hadn’t I thought of that?! Of course I didn’t like the recipe I found; too sweet and too oily and not enough flavour. Not to mention I don’t have half of the items it called for. For instance I only have access to quick cooking oats not whole rolled oats. I would usually put some flax meal in my granola, and maybe even some wheat bran, but I haven’t seen those in literally years. And of course the recipe called for agave syrup and muscovado sugar; as all “natural” recipes tend to these days. I used to use maple syrup as my granola sweetener, but that was back in good old Canader. Round these parts maple syrup is hard to find, and when it is on grocery store shelves I pretty much have to consider selling body parts to afford the darn stuff. A while ago, honestly way longer ago that I should admit, we bought a 2lt container of table syrup to enjoy when Steve made Sunday pancakes. Turns out we enjoy honey and molasses and homemade jam way more than mechanically separated sugar syrup. As a result I had a lot of it hanging around for way too long that we won’t use but I feel guilty about throwing away. I decided Stove Top Granola experiments would be the perfect way to start working my way through it. I dug out my favourite cast iron baking pan and turned on the flame. 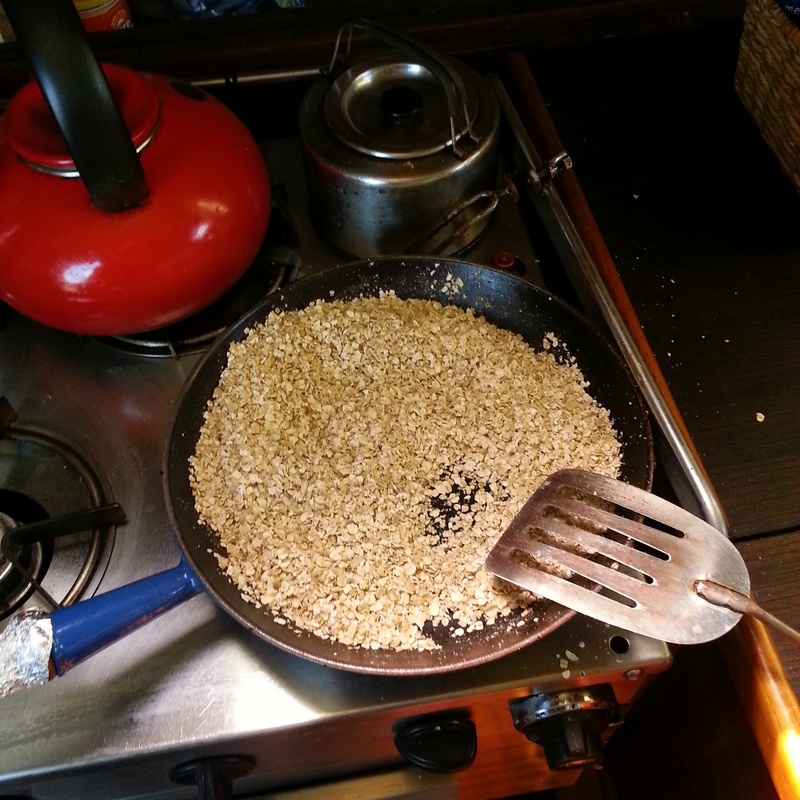 I added a couple tablespoons of rice bran oil before dumping in few big handfuls of quick cooking oats. After about 10 minutes of constant stirring I started to see some colour change and decided now would be the time to add the sweeteners. I used a couple tablespoons of the syrup and some unrefined cane sugar, which isn’t fancy just standard issue in the South Pacific where plain old white sugar is hard to come by. As the sugar started to melt and the oats started to get coated the granola started to come together. I had just bought some Chinese five spice and couldn’t fit it all in my airtight jar, so it went into the pan with some extra cinnamon and ginger and some nutmeg. 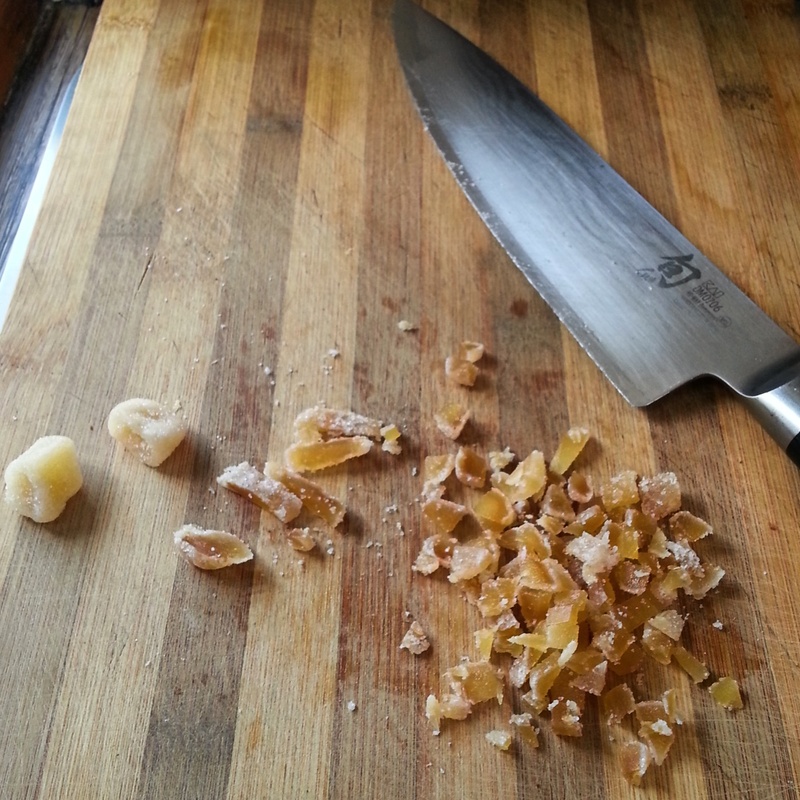 I kept stirring and as the spices hit the heat the air was laced with an exotic sweet perfume. If it tasted as good as it smelled I was sure to have a winner. Back in Fiji I had stocked up on candied ginger, dried cranberries and poppy seeds and recently happened upon pumpkin seeds in Port Vila for a reasonable price. Figuring they would be a good addition to granola all four ended up in my pan. I stirred it all in and then took it off the heat, sure that the residual heat from the cast iron would be enough to toast everything just slightly. Since I like my granola with a little crunchy and chunky I drizzled a couple more spoons of syrup over the pan, stirred lightly and let it rest on the counter to cool. The results were a unanimous success! The quick cooking oats didn’t make the granola floury, as I was worried they might. The candied ginger and dried cranberries along with the Chinese five spice made the granola feel a little more sophisticated than version of the granola I grew up with. 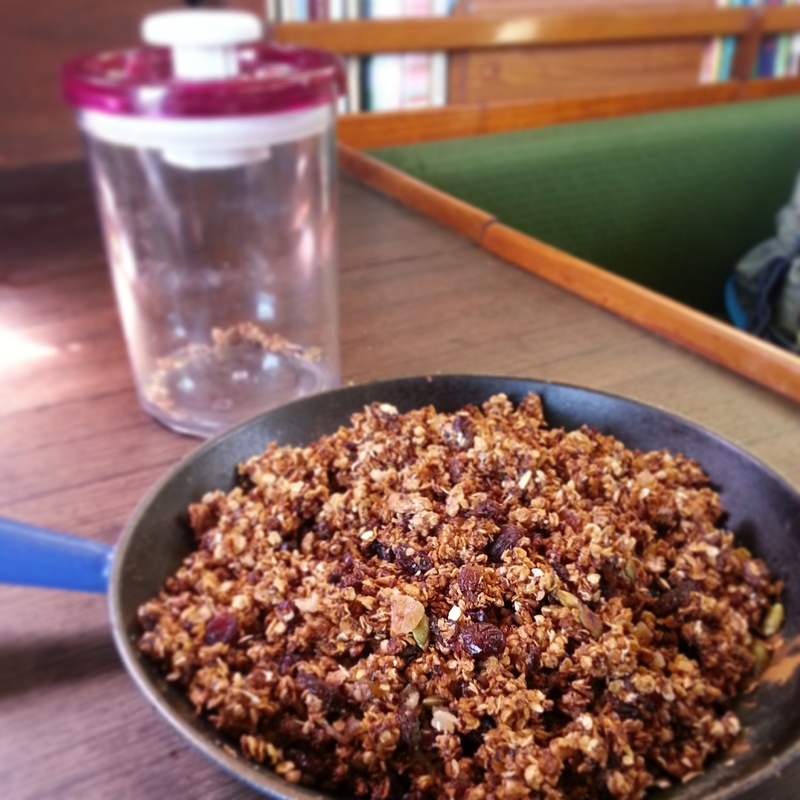 And by drizzling the syrup on the cooling granola I ended up with clusters of crunchy goodness, just as I had hoped. I put the granola in an airtight container but it didn’t last long enough to go soggy. It was delicious, even Steve started requesting some for breakfast with soya milk. Thankfully a couple years ago he also started insisting that I start writing down my recipes. I have made two more batches that turned out just as tasty but I sadly ran out of oats, of any description, this week. I couldn’t find oats in Port Vila that were half decently priced ($11 for 500grms!!!!) so I am hoping that our next big port in Santo later this week I will have luck. 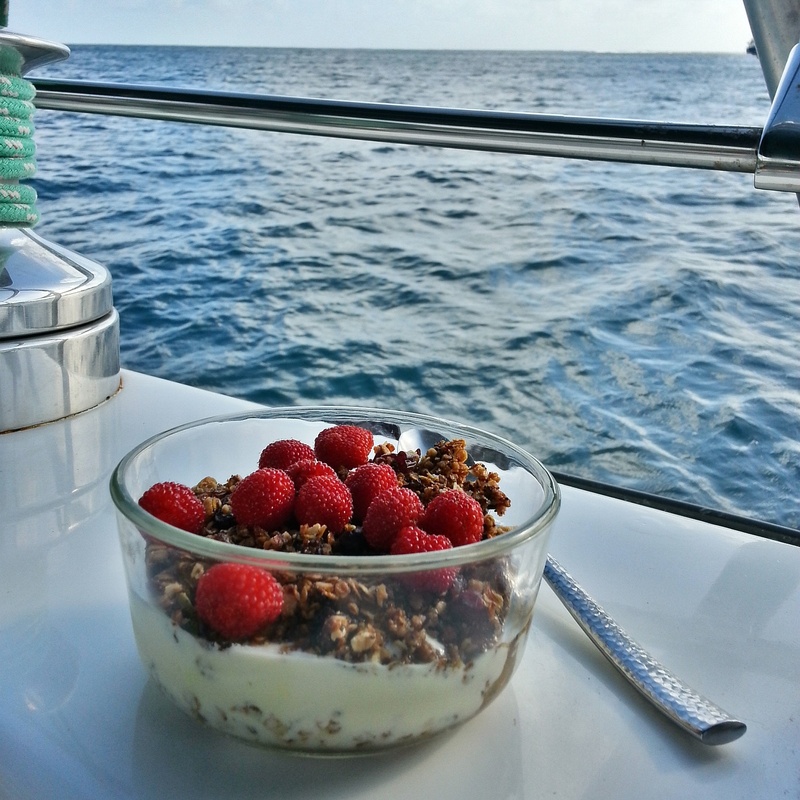 Until then this is what breakfast onboard is looking like. Heat a large cast iron or heavy bottomed pan, add oil and swirl to coat pan. Add oats and stir to coat. Toast until lightly golden, stirring constantly so they do not burn. Add 2 Tbsp of syrup and 2 Tbsp sugar and mix well. Continue to toast and stir until slightly browned. Add spices and stir quickly, add cranberries/raisins, candied ginger and pumpkin seeds stir well and remove from heat. Continue to stir as residual heat from pan will continue to toast granola. When cooled slightly drizzle with remaining 2 Tbsp of syrup and toss lightly. Leave to cool, undisturbed. Pack into an airtight container when completely cool and enjoy with yogurt, milk, soya milk, just hot water! *Coconut would be a lovely addition to this granola. I plan on adding some freshly toasted to my next batch as there are a few coconut palms in Vanuatu but dessicated would work, just be careful as it will add quite a bit of sweetness. Looks and sounds deelish! I’m going to make a GF version with Quinoa flakes while I’m in Antigonish.